Drugs in Thailand: Are They Legal? Make no mistake: drugs in Thailand are not legal! In fact, Thai law allows for the death penalty for anyone caught carrying, transporting, or using drugs. Yes, you read that correctly — the death penalty! Although this maximum sentence isn't often applied to Westerners, it is a possibility. Numerous travelers sit behind bars in Thailand awaiting trials for drug possession. Sometimes they wait for years. You can visit them and hear their stories during select hours open for foreign visitors. But as marijuana smoke wafts around you in some backpacker hostels, or you hear about bars in the islands that are famous for selling magic mushroom shakes, drug use seems casual and widespread. Access is easy. Sometimes psychedelic mushroom products show up in print, laminated on bar menus! This double standard, along with rampant police corruption and sporadic enforcement, lead to a few travelers every year getting caught up in a legal system where they can't even read what they are signing. An estimated 50 organized crime groups are involved in moving drugs, particularly methamphetamines, into Thailand from neighboring Myanmar. The "Golden Triangle" where Thailand, Laos, and Myanmar meet is second only to Afghanistan for production of opium poppies. Growing poppies provides revenue for ethnic minority groups living in poverty. Although cocaine, heroin, and other "hard" drugs can still be found, there has been a general shift to "lifestyle" and party drugs such as MDMA/ecstasy and crystal meth, appealing to the many travelers on holiday who have come to party in Thailand. Natural products such as marijuana and hallucinogenic mushrooms have been available and popular with travelers in Thailand for decades. Both provide a needed means of bonus revenue in impoverished rural places. Marijuana grows wild and is cultivated in the tropics, making it easy to find in Southeast Asia. Travelers often take advantage of its cheap availability. Some bars and guesthouses allow open smoking, but doing so is technically illegal. Depending on the quantity of the illegal substance that you are carrying (i.e., more than you can consume in one sitting), Thailand has the right to sentence you to death. These sentences often get "rounded down" to life in prison. In 2001, Thailand made world headlines for publicly executing five people, four were drug smugglers, by firing squad. Although Thailand's last capital punishment execution took place in 2009, Thai prisons contain plenty of travelers sentenced to life who are awaiting either help from their governments or a royal pardon. If you are busted trafficking drugs in Thailand, there is no guarantee that your embassy will intercede or be able to help. You'll be on your own, possibly for years, waiting on a bureaucratic — and often corrupt — process to finally get you a court date. Receiving a royal pardon or securing release could take a very long time. Drugs such as magic mushrooms and marijuana are relatively cheap and easy to buy in the Thai islands. Despite being illegal, drugs can be purchased openly in a few bars on the island of Koh Phangan. 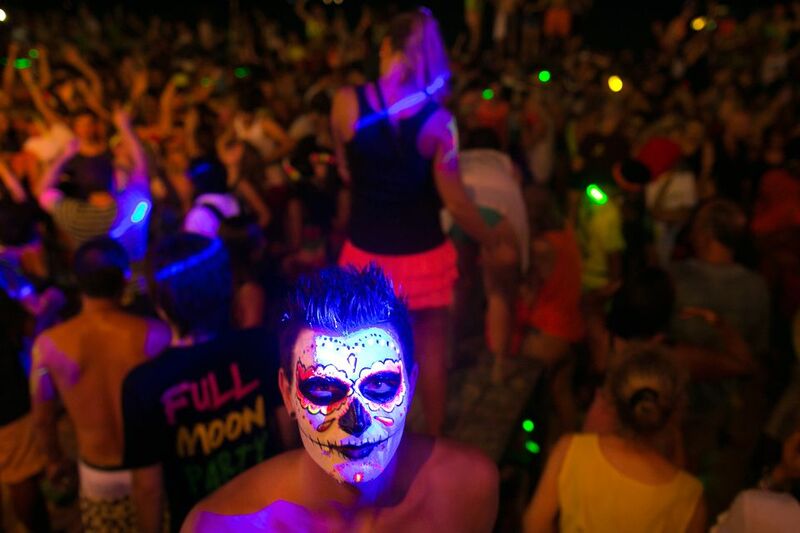 Haad Rin, a peninsula of Koh Phangan, is famous for the monthly Full Moon Party where many travelers try psychedelic mushroom shakes to enhance the experience. Electronic music parties at Haad Yuan are also sometimes enhanced with illegal substances. Although specific bars along the beach at Haad Rin are still allowed to sell magic shakes by paying monthly "fines," sometimes police watch for travelers who exit these establishments. Don't carry anything out! Undercover, plain-clothed police — some real, some not — do roam the Full Moon Parties to entrap people by trying to sell them drugs. These situations often require the "officer" asking for a large bribe. Is Marijuana Legal in Thailand? No. But more than a few backpackers have fallen victim to a simple-but-effective scam found all over Southeast Asia. When a traveler asks in a bar to purchase marijuana, the bartender sells it to them openly, causing many people to think it's no big deal. He then immediately phones an associate who may or may not be a legitimate police officer. The cop then shakes down the traveler, busts them with the weed they just purchased, and demands an expensive bribe. The weed is confiscated and given back to the barman who shares in the bribe. The same product is later resold to the next unsuspecting traveler! Unlike in the United States where a prescription is required to obtain controlled medications, you can simply walk into many pharmacies throughout Thailand and purchase prescription drugs. The pills usually cost a fraction of the prices seen in the United States. Although easy access can be handy for getting antibiotics or necessary medicines while traveling, some tourists abuse the open system and purchase large quantities of Valium (diazepam), sleeping pills, pain killers, Ritalin, Viagra, Adderall, and other popular drugs to take home. Carrying these pills without a prescription or medical passport is illegal. A strip of Valium confiscated by authorities may get you a "no-no" wag of the finger, but too much may have you stammering for an explanation in an airport back office. Another concern is the proliferation of fakes at pharmacies in Thailand. Generic, low-quality strips of pills produced in India are sometimes substituted for popular choices such as Valium and sold at pharmacies in the Khao San Road area in Bangkok. Throughout Southeast Asia, you'll sometimes encounter signs or menus advertising "magic" or "happy" foods and drinks. "Magic" typically means that the shake or drink contains psychedelic mushrooms, and "happy" denotes marijuana. Magic shakes are most widely available in Pai, a popular tourist stop in Northern Thailand, and the islands. Thailand's stance on drugs may seem extreme, but their neighbors are even more strict! Getting busted in Singapore is no laughing matter; they impose a mandatory death penalty for drug traffickers and have executed several foreigners over the years. Vietnam executed 85 people in 2007 for drug-related crimes. The ongoing "war on drugs" in the Philippines has been responsible for the deaths of more than 20,000 people since 2016. Despite the threat of death penalties or severe prison sentences throughout most of Southeast Asia, a few traveler hotspots along the backpacker Banana Pancake Trail still openly advertise drugs without fear of repercussion. Vang Vieng in Laos, famous for their tubing on the river and once-rambunctious party scene, is one such place. The Gili Islands in Indonesia, particularly Gili Trawangan, also have magic mushrooms listed openly on bar and restaurant menus.